Men's Cross Ring set with six clear, white topaz gemstones in .925 sterling silver. Face/top of ring measures 11mm x 9mm. Band measures 10mm at the top and tapers near the bottom. 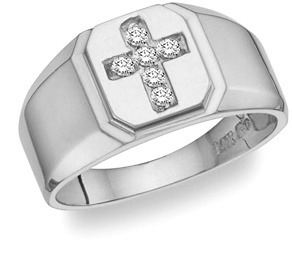 We guarantee our Men's White Topaz Gemstone Cross Ring in Sterling Silver to be high quality, authentic jewelry, as described above.